The Barra MacNeils have been known to ignite the Christmas spirit. At least that’s what they’ve been told, anyway. Kyle MacNeil said he’s often told audience members say they weren’t in the holiday spirit until they saw An East Coast Christmas. “I’m right in the swing of things now,'” MacNeil said he hears after concerts. The group mainly consists of MacNeil siblings, although they did let one outsider into the mix, bassist Jamie Gatti. Lucy, Boyd, Stewart, Kyle and Sheumas MacNeil make up the rest of the band, with only one sibling missing on stage, a brother who now lives in South Africa. As kids who grew up with instruments in their hands, it’s no wonder they all went on to study music in university. When they’d go home for the holidays during their studies, they’d play a Christmas concert at a local pub. That concert lead to others, and their Christmas tour grew and grew. For the last 19 years, the Barra MacNeils have toured the country for the holidays, spending five weeks a year on the road. 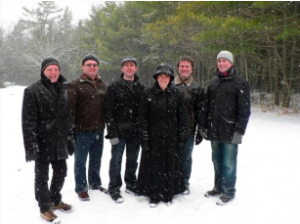 An East Coast Christmas combines music from their three Christmas albums, with music from their latest album, too. On the Bright Side has a Celtic feel and came out earlier this year. “It gets tougher and tougher every year to get all the material in,” said MacNeil of the concert set list. It’s even more festive for the MacNeils, who perform it for weeks on end leading up to Christmas. “It’s five weeks of Christmas with your family every day,” MacNeil said with a chuckle.